﻿What a wonderful visit I had to Dale Deppe's personal "proving grounds!" Throughout the western Michigan property, which Dale generously shared for a tour, shrubs already introduced and those vying to be named a Color Choice selection created a gorgeous private arboretum. So many of the Color Choice shrubs not only bloom in spring, but re-bloom to a lesser extent in the fall. What a surprise it was to see quince blooming during the second week in September! ﻿Abelia 'Bronze Anniversary showed off colorful bracts, new flowers and a flush of foliar growth all at the same time. Although rated hardy to Zone 6, it was certainly looking its best in a zone closer to 5! Meanwhile, back at Color Choice headquarters, Communications Specialist Ryan McGrath﻿﻿ showed me around the demonstration beds where I fell in love with a Hydrangea called 'Blue Bunny'. It's a cultivar of the species involucrata, aka bracted hydrangea, and is rated hardy to Zone 6. 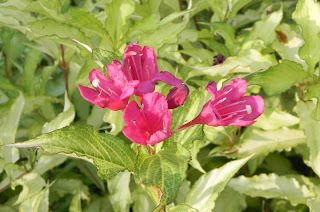 However, it blooms on current season's growth, so losing flower buds in the winter is not a concern.